There are a lot of different features on a vehicle that contribute to its overall success. Many people care about how much power is under the hood. Other people want to know all about the safety features that are included. For most consumers, interior features are most important. 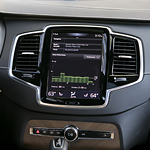 The new Volvo XC90 is a vehicle that provides interior style with comfort and safety. Let's take a closer look. With seating for up to seven passengers, everyone will stay comfortable thanks to four-zone climate control functions. A moonroof lets you take a peek at the skies, and 10-way power seating in both front seats will ensure that you are comfortable and safe on the road. You'll love the 14-speaker Harman Kardon stereo sound system or the 19- or 20-speaker Bowers & Wilkins sound system upgrade.